In 2014 we rolled out a scholarship program for the Annual Conference for Administrative Excellence. We’ve never offered a scholarship for our administrative conference in its history – now hosting our 23rd year. We were thrilled with the quality of applications received and that the scholarship winners continued their relationship with Office Dynamics International after their experience with our event. We planned to continue to offer the program. Our 2015 event sold out before we could even launch our scholarship program! We approached the scholarship program a little earlier this year and received twice as many applications than we did in our first year. Again, we were impressed with the quality of many of the applications that we received. It was a hard selection process but after each of our team members rated the applications and came together to add up the scores three winners quickly rose to the top. 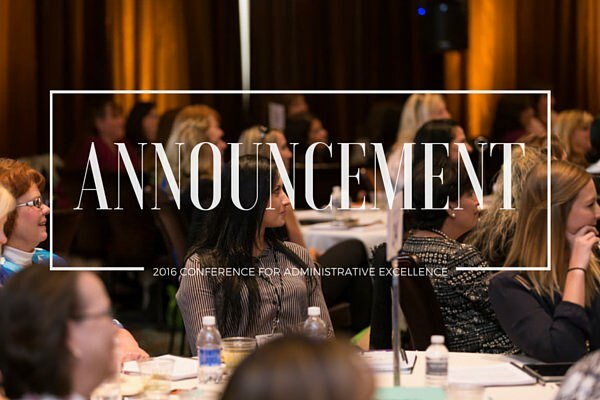 We offered three scholarships for the Annual Conference for Administrative Excellence.